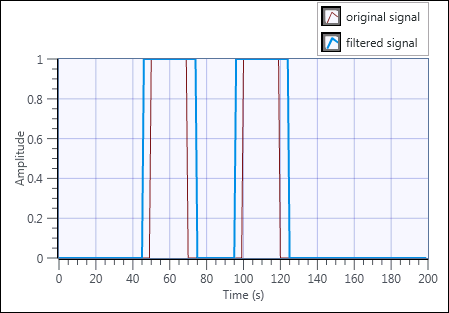 Filters a signal with a specific structure element using a mathematical morphological filter. Method by which to extend the input signal at both ends of the sequence. Zero padding 0 Extends the input signal by padding zeros at both ends of the original signal. Symmetric 1 Extends the input signal to form a new sequence that is symmetric at both ends of the original signal. Periodic 2 Extends the input signal to form a new sequence that is periodic at both ends of the original signal. The following illustration represents the output sequence when extension type is Zero padding. Where X is the input signal, and k is the length of structure element. The following illustration represents the output sequence when extension type is Symmetric. If k > n, this node pads X with k - n zeros at both ends of the new sequence, where n is the length of X. The following illustration represents the output sequence when extension type is Periodic. If k > n, this node periodically repeats X more than once at both ends of the sequence. Structure element to use in the filtering process. Fundamental operation of the morphological filter. Dilation 0 Specifies to perform dilation on the input signal. Erosion 1 Specifies to perform erosion on the input signal. where x(i) is the ith element in the input signal and s(j) is the jth element in structure element. The following image shows an example of the dilation effect. The original signal consists of two pulses with widths of 20, and the structure element is an array of ten zeros. The filtered signal expands the pulses in the original signal. The following image shows an example of the erosion effect. The original signal consists of two pulses with widths of 20, and the structure element is an array of ten zeros. The filtered signal shrinks the pulses in the original signal. A Boolean that specifies whether to perform zero-phase filtering of the signal. 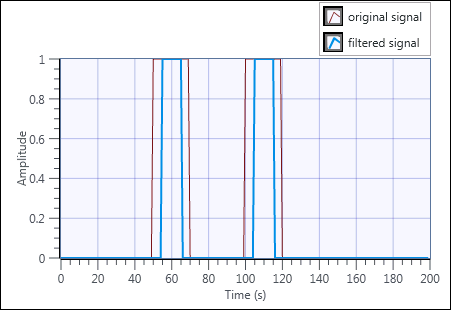 True Performs zero-phase filtering of the signal. False Does not perform zero-phase filtering of the signal.